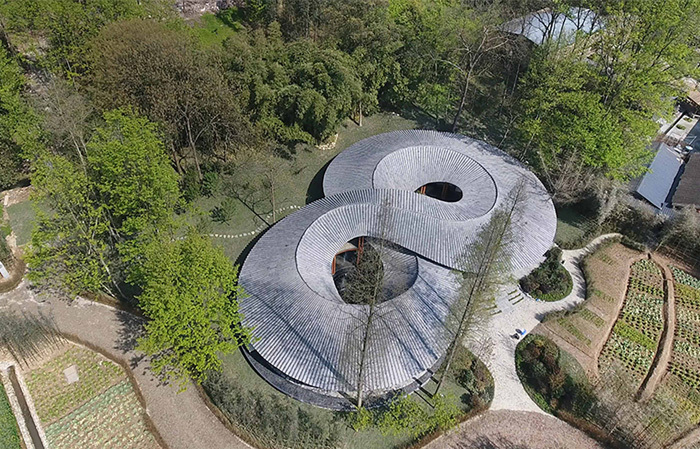 In the press conference of ‘16th Venice International Architecture Biennale – Chinese Pavilion’, an rural ‘infinite（∞）’-shape architecture and a whole villages planning design appear in public on 27th, April . 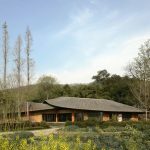 It is the new project completed by Archi-Union in Daoming Town, Chongzhou City, Sichuan in early 2017. 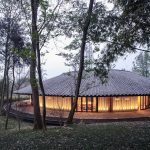 It is a multi-functional rural community cultural center locates next to a village road, behinds a mount and partly hidden in bamboo forest. The gestural interweaving roof is a construction of many prefabricated parts delivered to the site ready for quick assembly. 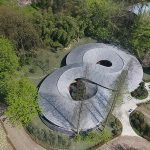 The Mobius-shaped roof is supported by a 70% light prefabricated steel frame and finished with traditional ceramic tiles. The high efficiency afforded by pre-fabricating components made the 52-day construction period of this complex geometry possible. 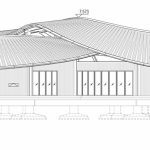 The cultural center we completed is provision for exhibitions, hosting conferences, community gathering, as well as dining and recreation. 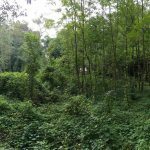 It integrates the site with the surrounding villages and with the natural ecology. The project also explores the interaction of the city with new rural construction. It practices the integration of new construction technology with local craft. 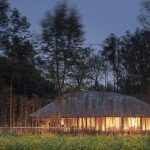 The project integrates traditional construction techniques with prefabricated industrialization. 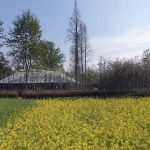 The first time we came to the Chongzhou area, our client introduced us to the surroundings with a poem by the Song Dynasty poet Lu You. And she said ‘Lu You is a signature of Chongzhou and had been in here as a local magistrate. So, we find a poem from him is perfect to describe leisure and comfortable life in Daoming. After hearing this poem, we discovered one way to truly understand the depth of this poem was to be in Chongzhou and see this site. Seeing the landscape before us after hearing the poem enabled our concept for the project to begin to take shape. We started to see the site in richer ways as it related to the village life and the countryside surrounding it. The site crosses a narrow stream. And then again, the site crosses a different stream before beginning its march up the mountain. A forest plain stretches out; bamboo grows thickly. “Building can only try to start a dialogue with earth, while plants belong to the earth. We were trying our best to maintain everything, and keep the most stay still,” -principle architect Philip F. Yuan. One brush stroke, one period of creating, these are values held by the Chinese traditions of landscape painting and of garden construction. 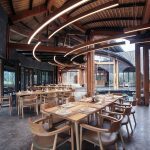 With this in mind, we approached our site with all its vivid naturalness, all the while being mindful to treat it with a contemporary perspective and attitude. 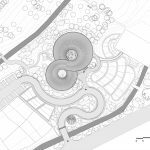 Looking between the architecture and the site, relationships can be made that supersede linguistics and materialism, relationships that find their way into a zone of pure geometric shape finding and materialization. The dwellings nearby have much to say about the character of this location, they speak the language of local material and enduring climate responses. 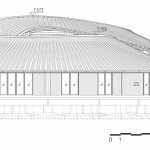 The doubly-curved geometry of our roof design is difficult to achieve using a continuous material. 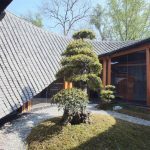 A way forward was found using gray roof tiles discovered in the local architecture of Daoming. On the roof of our building the tile is like a pixel, computed to describe the subtle geometric complexity of this continuous roof. 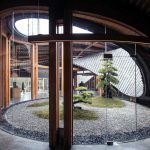 In this way the tiles became the intermediary linking vernacular building language with abstract geometry and became the most signature local building language of this project. The site is large. 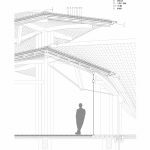 Responding to the spatial mood of the Lu You poem, we sensed the importance in finding an appropriate path for the dialogue between the viewer and the building in this project. The distance from the road to the building does not exceed 20 meters. With this constraint the question of how to prolong the process of experience of expectations became important. 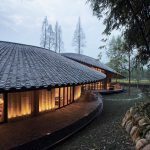 In In Bamboo, the S-shaped road leading up to the building and the S-shaped roof create a strong vocabulary found echoed in one another. This geometry vocabulary imparts a mood felt throughout the project. The building’s pinwheel spatial organization, found on the exterior and interior of the building, doubles the length of the distance traveled and lengthens the experience, slowing the movement of the visitors as they pass through the spaces. 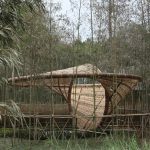 The play between transparency and opacity in In Bamboo is similar to a Chinese garden. 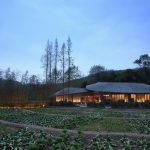 The bamboo forests, our building, the courtyards, the fields are all sequenced one after another; they can all be seen from one or another. From the road looking in one can faintly see the form of a twisting roof. It should be summarized in one stroke but that stroke should not deplete the ink, it should meander yet not lose its sense of place. The visitor should pass through layers of transparency and different ways of interaction while moving within this building. 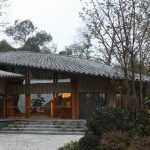 When the sunlight is strong, the light penetrates deeply into the building, creating the following sequence: the bamboo on the periphery remains shadowed, the vegetable garden is illuminated before it, eves extend from the building and cast a playful shadow giving description to the two courtyards within. This rich scene is filled with layers. Within the space there are actual layers of space and architecture, between these physical layers imagined ones too can emerge. China’s rural construction industrialization process has not yet begun in earnest. Gentrification and modernization is crushing the awareness and advancement of production systems in the countryside. At this moment, prefabrication for use in rural areas could redefine and upgrade the production process of traditional rural construction. 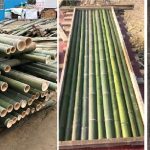 In Bamboo stands as an example of how this process might be realized. 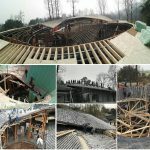 In total the project required one month of timber prefabrication in the workshop and 52 days of on-site installation. 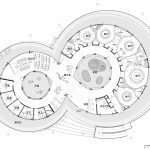 Citing this project as an example, robotic fabrication and other new technologies introduced into rural architecture construction could result in more meaningful and lasting changes for the rural construction industry. 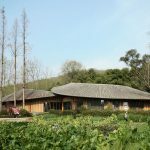 Daoming Town is well known for its enduring tradition of bamboo-weaving. 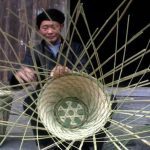 In Daoming, the practice of weaving is more than a rural industry, it is an integral part of the way families in the town spend time together. 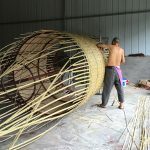 The traditional Daoming Bamboo-Weaving craft is a living cultural heritage with much in store to offer contemporary ways of living and making.For In Bamboo, we looked at local architecture industry research and learned that using bamboo for use as a protective sheathing on the exterior façade of a building performs very well. 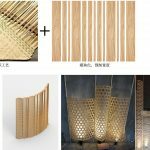 We worked with a local bamboo artisan who modeled over 20 variations of different weaving patterns using thin strips of bamboo to arrive at the façade pattern we used for In Bamboo. 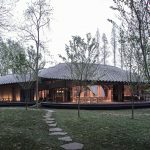 The use of woven bamboo on the façade produces an effect of seeing something familiar but encountering it in a new context. The distance between the main building and the site entrance is long so we designed a security guard shelter to be placed at the entrance. 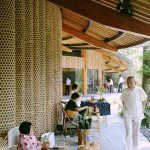 Here we used a similar approach as used in the main building design, again combining topological form finding and traditional bamboo-weaving. This combination produced an organic combination of digital geometry and traditional craft. 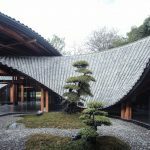 The relationships of inside & outside, bamboo & tile and new & old are all able to be experienced in the “infinite（∞）shape” of the roof. 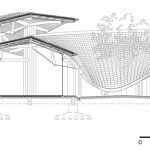 The new definition offered for traditional paradigms and the rethinking of rural & urban issues provide a lens for thinking about the meaning of architecture in the present time. Although the project is small, we invested great effort requiring the participation of many people. Digital design technology, architecture traditions, and cultural context are the combined forces guiding our work. 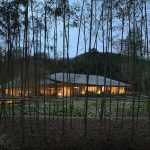 In the process of innovation, a respect for culture, a respect for people and a respect for nature can be present; this is what we want from the In Bamboo project.